Items 15- out of displayed. 10 year US note at resistance, SP500 at Support? Below is the chart that can be very important for stocks as we approach the year-end. It's 10 year US note vs SP500. 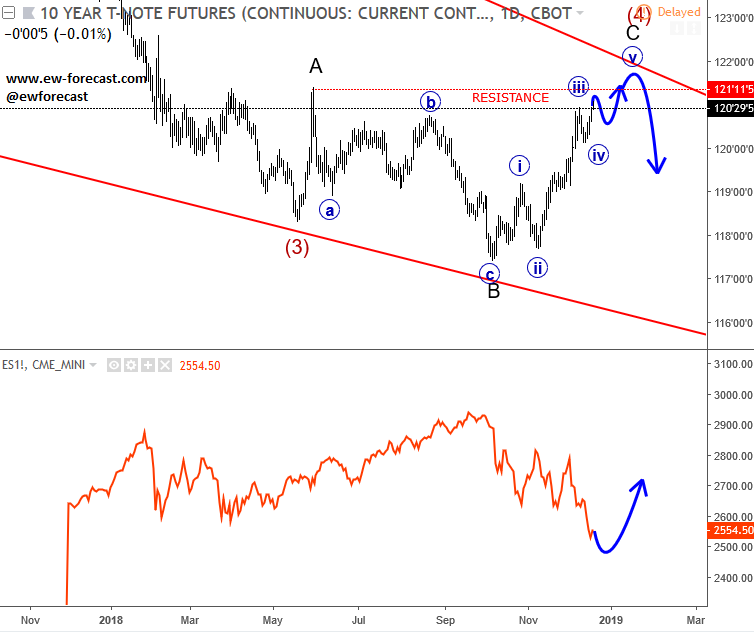 A turn down on 10 year US notes from 121 (where wave four flat may come to an end) may cause a bounce on stocks. Also, SP500 is at very interesting Feb 2018 level. AUDUSD IS Turning Bearish; Back to 0.7? After some time, I have decided to share some free updates and analysis with you as I think this one can be very interesting based on clear pattern. 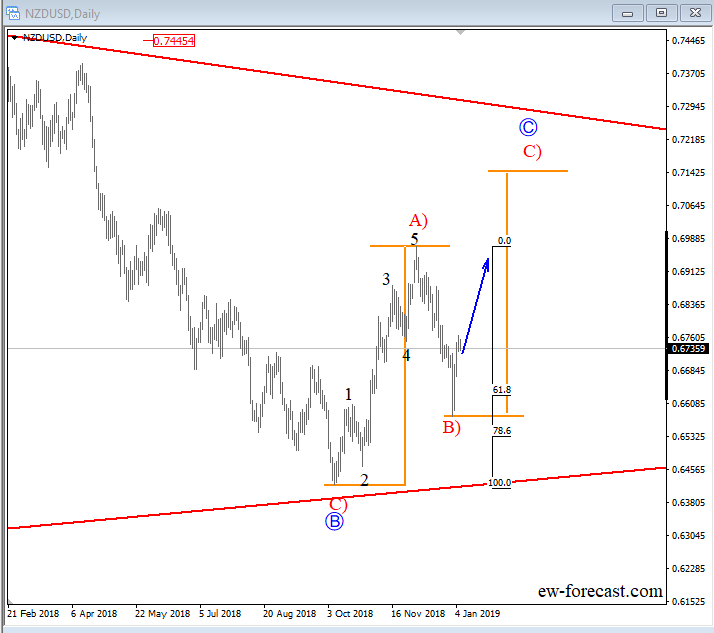 I am looking at AUDUSD this week which has a nice and clear five wave drop from 0.7393 levels. Notice that this fall also took out the trendline connected from 0.7023 level which is an evidence of a completed corrective bounce from October low. As such, I am interested in trades on the short side of the pair, especially after intraday rally back to 0.7300 area which can be seen as wave 2) that may stop at that broken trendline. Even if that’s going to be wave B with limited upside, there is still room for a move lower to around 0.7100. 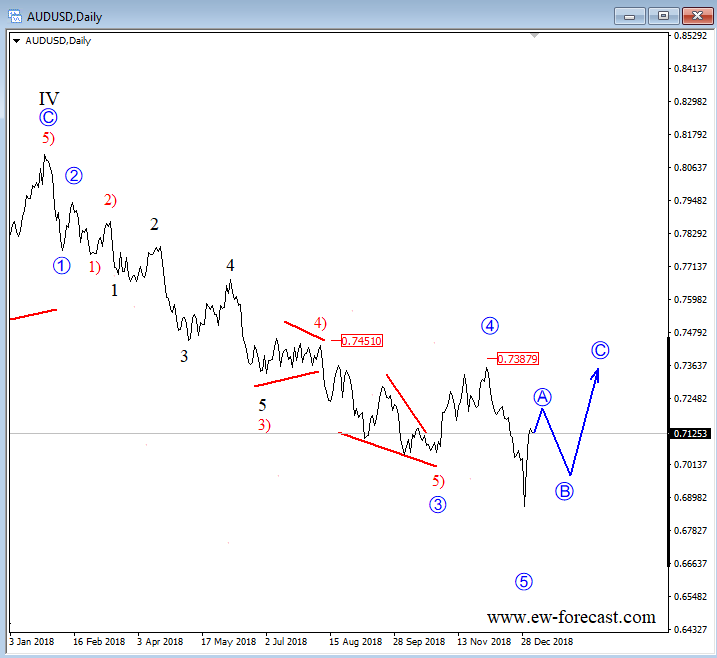 What is also very interesting when it comes to Aussie, is that this one is trading south despite strong Gold which is higher in a fifth wave, so now imagine what may happen to AUD if Gold suddenly finds a top and completes current uptrend. I think that in such case AUDUSD pair may fall very hard. On metal I am looking at 1250-1257 as potential resistance for current five wave cycle up from 1211. 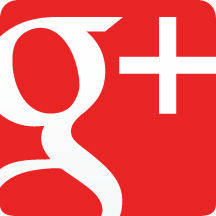 If you want to track AUDUSD with me and stay on track of the wave count then make sure to check our services. EURUSD; H&S Bottom In The Making? 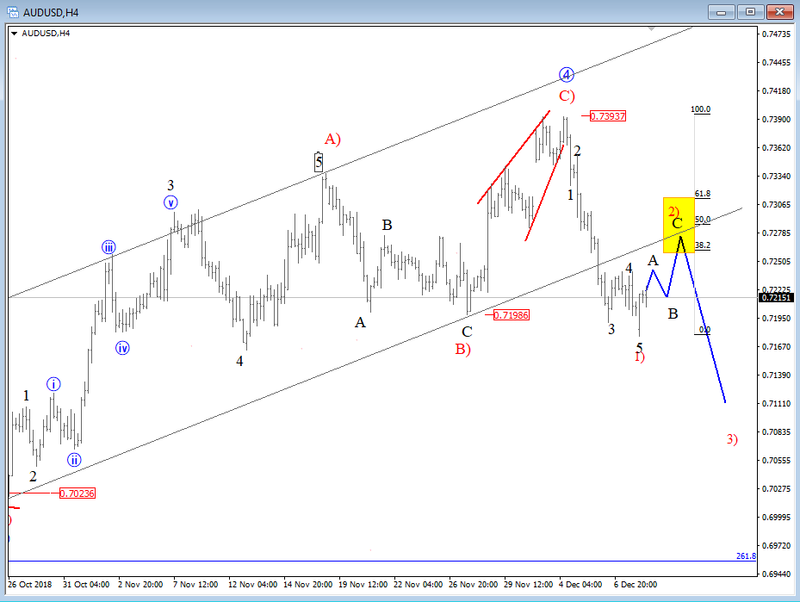 EURUSD rallied earlier up to 61.8% as expected from where we already see a reversal so it seems pair wants to go lower into wave c now; third leg o a pullback that can be looking for 1.1320, where new buyers may show up especially if we consider potential H&S bottom on the 4h time frame. However, keep in mind that H&S bottom is not confirmed until we see a broken neckline which would be only if pair goes back to 1.1470. Are BTC And GBTC Already Searching For A Support? Today we will talk about Bitcoin Investment Trust – GBTC chart. Bitcoin Investment Trust is an entity that was established to give investors a way to get exposure to the bitcoin market without actually buying their own Bitcoin, but of-course it follows it when it comes to the direction of a price. So sometimes, when we analyze it is good to look at different products and see if maybe on some of them there are any interesting patterns forming. What we are looking at below is a wedge pattern with price now trading at the lower trendline. So it can be an important do/die zone that we should be tracking closely if maybe we get some bounce from here. 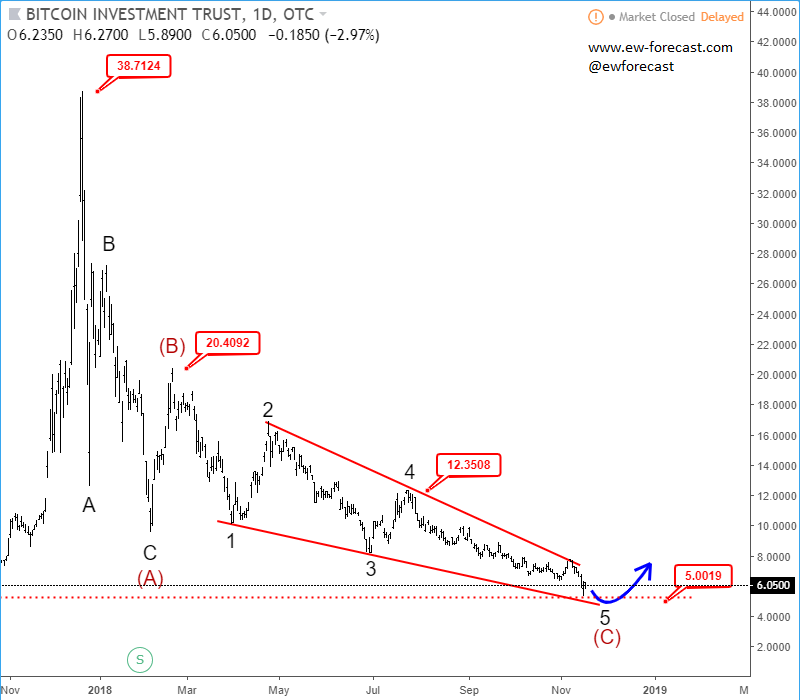 However, it will be very important for investors to see GBTC forming a low before they act or may want to call any bottom here. We are talking about confirmation, which would be only a rise above the upper resistance line. So now its definitely to soon for any bullish call, but if we are on the right track, then 2019 could be an interesting year for sure. At the same time it's good to keep an eye on stock market. 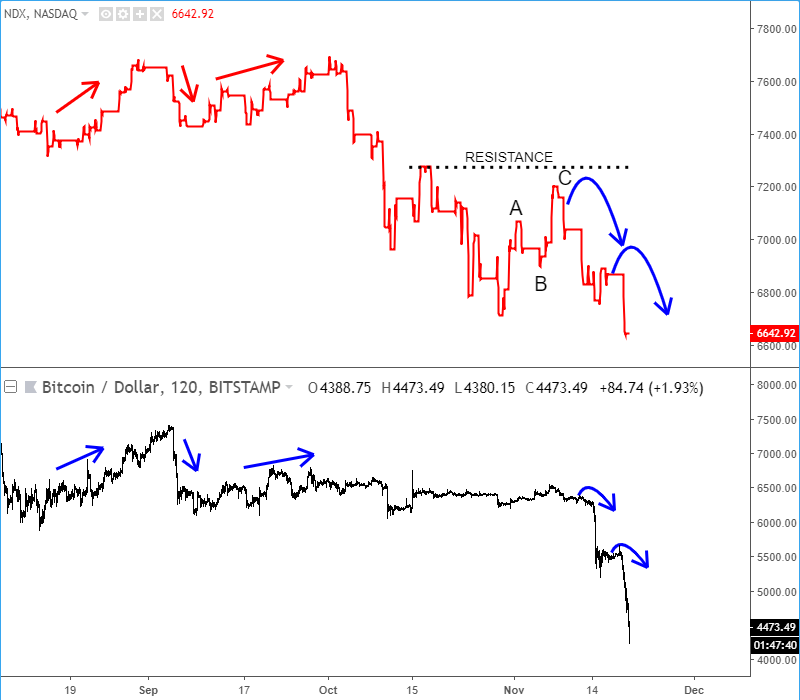 You might noticed tight correlation between BTCUSD and NASDQ100 maybe, so if you are waiting on bullish Crypto trend, we suggest you to track US stocks too and wait on price to stabilize first. For now that is not the case yet, but it can be interesting once US stocks moves below Oct 29 low, as that is when bears may start looking for a base. USD In Pullback, BTC and Stocks Lower; More Damage Ahead? USD Index is turning lower for the last week or so, while gold bounces and stocks keeps moving lower. This is an eviroment where USDJPY find itself on a bearish track that we have been talking a lot in the last two weeks. I am talking about this development in the video below, and alos covering some of interesting patterns on other markets as well.